Tejo (pronounced teh-ho) also known, to a lesser degree, as turmeque , is a traditional sport in Colombia. Many theories surround the origins of this traditional sport, however there is no convincing evidence due to the lack of oral tradition among native Chibcha people and the lack of archaeological records that could indicate its actual origins. There is not one widely accepted theory on the origins of Tejo. In fact, it is believed that many of the current theories circulating on the internet might be fictitious and a result of "word of mouth" and speculation. One of the common misconceptions is that this sport originated with the Muisca people whom it was believed would play with a golden disc. This theory seems unlikely since the Muisca people didn't have gold in large quantities and, therefore, it is unlikely they would use it for play. It is, however, widely accepted that the sport has origins in native aboriginals from the center of Colombia, where it might have been played in a similar form. Another theory presented by the Colombian government on its website describes the game as having originated more than 500 years ago. In this theory, presented by one of the most important authorities in the country, the sport was played by native aboriginal people that would use a golden disc called zepguagoscua. This, however, is refuted in other sources as a word with sounds not existent in dictionaries of Chibcha language. Tejo is a sport much appreciated by the popular strata of society. Although there are Tejo arenas targeted towards those of a higher socio-economical strata, most of them are made and used by those of the popular class that see it as a portrait of their pre-Columbian origins. Only soccer enjoys a more numerous following and developed industry in the country. Note that Tejo, originating in Colombia, has professional teams in neighbor countries including Venezuela, Ecuador and Panama. As the cultural baggage of the sport is foreign to those countries, their following and industry are much less developed than in its country of origin. Depending on the context, Tejo can be played in either a formal or informal sense from collecting points to professional championship tournaments. 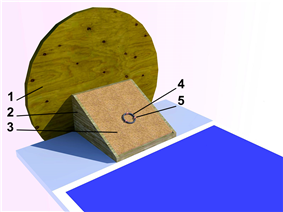 The game consists of throwing a metal puck/disc, weighing approximately 680 grams, across an alley at a distance of approximately twenty metres, to a one metre by one metre board covered with clay and set at a forty-five degree angle. This metal puck is the "tejo" itself. The posts are located at every extreme of the field. This posts consists of a wooden frame that holds clay and a protective board to keep the tejo from hitting other elements or people in the neighboring area. Inside the frame, there is a metal pipe strong enough to withstand the continuing impacts of the tejo. This pipe is the target where the tejo is meant to hit. The pipe is set in the same angle than the post's frame (45 degrees). The tejo must be thrown from within the throwing area and the goal is to impact the inside of the target at the other extreme. A chief characteristic of the sport is its use of small exploding targets that contain gunpowder, commonly known as "mechas". These usually triangle-shaped envelopes with explosive material inside are set on the edges of the pipe where on impact with the tejo explode loudly creating a sound similar to the one created by a small revolver upon firing. Hand: It grants 1 point to that tejo that is closest at the end of a round. Hit: It grants 3 points to every player that explodes a mecha. Bullseye: It grants 6 points to that player whose tejo has impacted inside the target. Strike: It grants 9 points to that player that has a hit and a bullseye in the same throw. 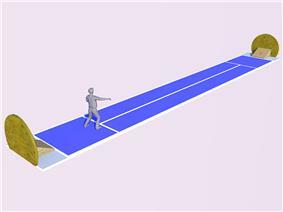 The pitch or post is usually a wooden box of approximately 90 cms (35 inch) wide and 1 meter (40 inch) long, filled with clay, and either tilted or cut at a 35 to 45 degree angle. The clay used is anything from average mud to modeling clay, depending on the setting of the sport. The tejo gets embedded in the clay upon landing, and depending on the consistency of the clay, the tejo can be easily reached or sometimes it becomes necessary to dig a little bit to find it. This makes the consistency of the clay very important. 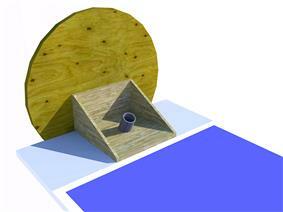 The protective board is meant to keep the tejo within the boundaries of the field when the tejo is off target. The size is not standard, but the idea is for it to be proportionately bigger than the pitch itself. The target is usually a metal pipe cut or set in a way that it won't be easily moved by the impact of the tejo hitting it at a high speed. In most cases, it is either soldered or screwed to the frame. There are no standards on the construction of the pitch given the traditionalism of the sport. In Colombia, it is very common to find professional Tejo teams around the major cities and smaller towns. Most of these teams are sponsored by beer companies, which causes the teams to profit greatly due to the strong bond between the team and company. In the past, the playing of Tejo was fueled by "Chicha" (an indigenous maize-based alcoholic beverage), but, more recently, the players refresh themselves with beer. Modern Tejo competitions are highly organized tournaments and are usually sponsored by beer companies, those in the construction industry, and the autoparts industry. Tournaments, known as "torneos Relampago," are the most common, usually played in just one weekend by direct elimination of teams. Prizes include trophies, medals, and money. Household items are awarded to finalist in combination with money or coupons. Tejo has no mass media coverage, apart from National Games, but sponsoring and very targeted marketing efforts make it attractive to brands that position themselves as "popular" since public affluence to the tournaments is numerous. 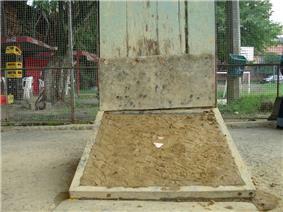 Tejo is a sport that has been widely exploited by beer companies in Colombia and, in the context of sports, is unique in the sense that playing Tejo and beer consumption is almost understood to occur simultaneously. There are no statistics on how many people consume alcohol while playing tejo. Tejo has become a popular cultural activity for backpackers traveling Colombia, with a number of hostels throughout the country hosting free Tejo nights.